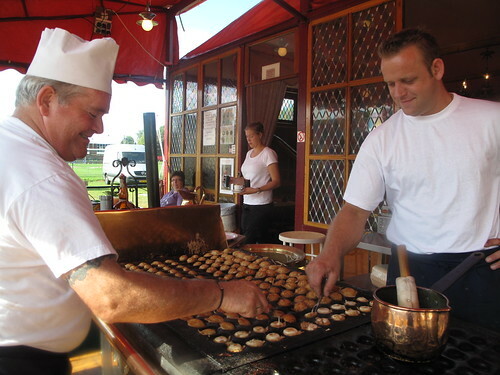 Poffertjes are mini pancake discs popular with parent and child alike. 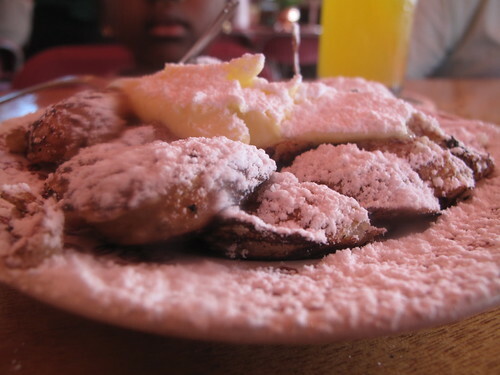 They are made in special pans and then topped with knobs of butter and a snow storm of icing sugar. Liquers, fruit, savoury toppings are well-know accompaniments to this Dutch delight. 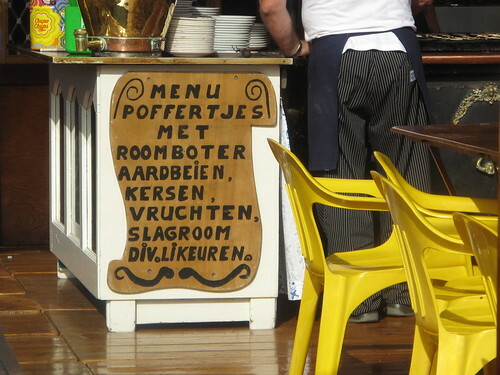 However, the Dutch scorn those who plate them up for breakfast. 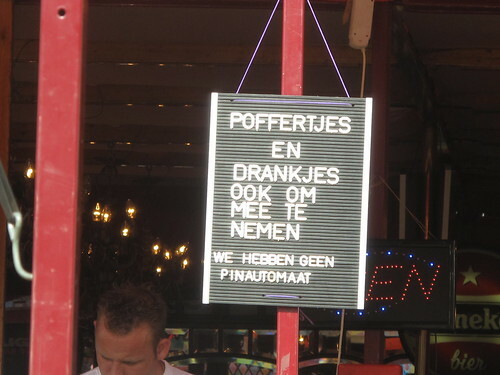 If in the company of a true Dutchman, don’t try this. 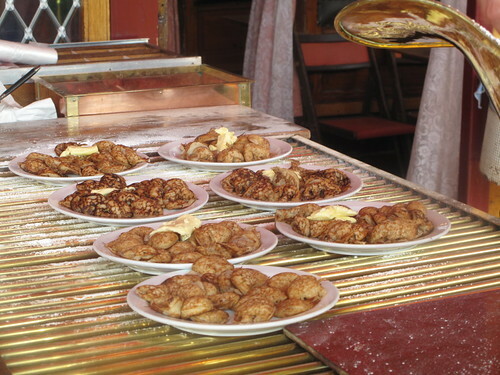 In a conversation in the very recent past, I asked a Dutchman if he would have them for breakfast and he said ‘when I’m in Holland – NEVER, but when I’m in the US, yes’ I was flabbergasted. In my point of view, same difference but never mind. I was lucky enough to catch a demonstration of how they’re made (industrially!) The mix is essentially a pancake mix and I guess as with most pancake batters, it is made and left to rest for a few minutes before being fried. 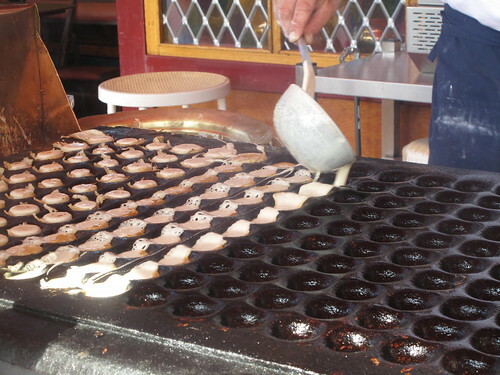 A lot of online shops stock pre-packed mixes and pans, all you have to do is Google poffertjes and see what turns up! 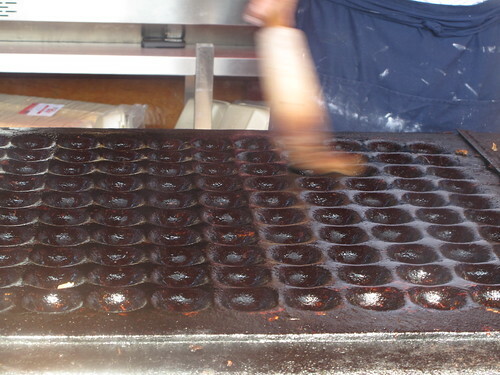 The next step is heating up the cast-iron pans – or in this case trays and then they are greased. Then the chefs take up position – one on either side! One guy is the pourer and the other the clearer. 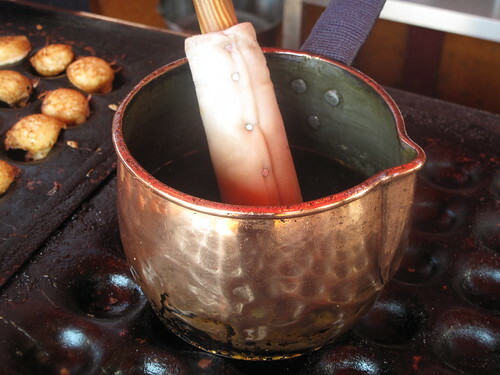 Once the pans are hot, the pourer scoops a ladle full of mix and tips it out into the holes. This is done in sequence, one row after the next. 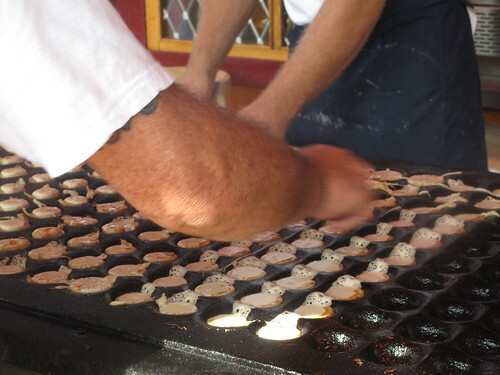 Because this method of pouring connects all the puffs, the raised bits in between the depressions need to be ‘cleared’ so as to separate and create individual puffs. This is the task of the scraper on the other side. 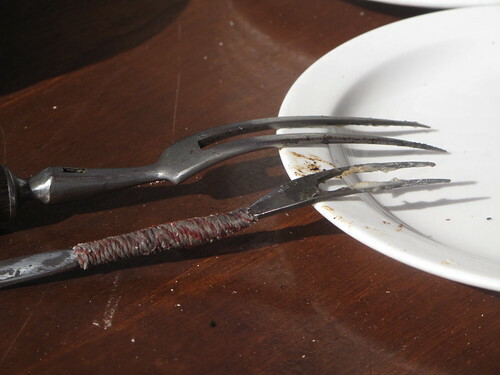 Using a special 2-pronged fork, he rapidly removes the interfering bridge in sync with the pourer. 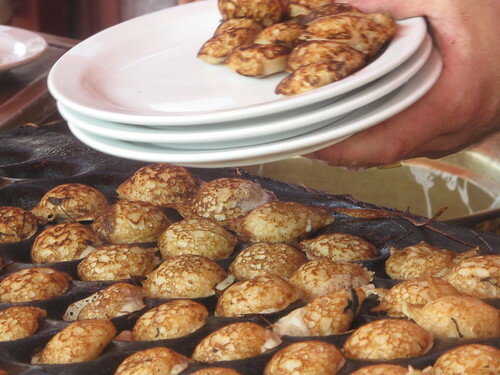 A minute or two later, you’re left with single pancake puffs that are all alone in the world. All by themselves. 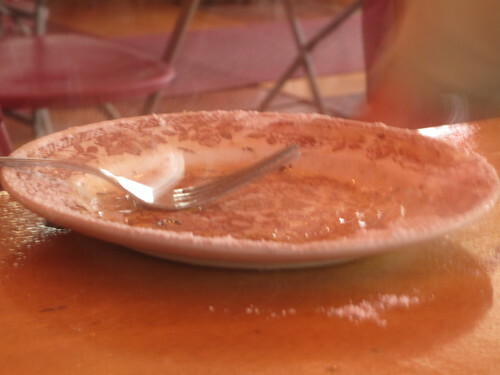 and them a minute later, forking them out by the 4s onto plates – small or large. That’s not the end. 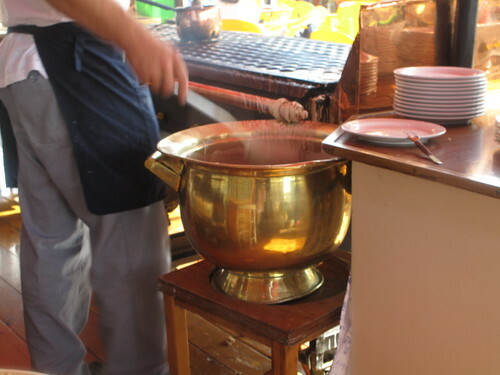 They are quickly transported to a conveyor belt guarded on one side by a huge knob of butter (at room temperature) and on the other by a huge bowl of icing sugar. 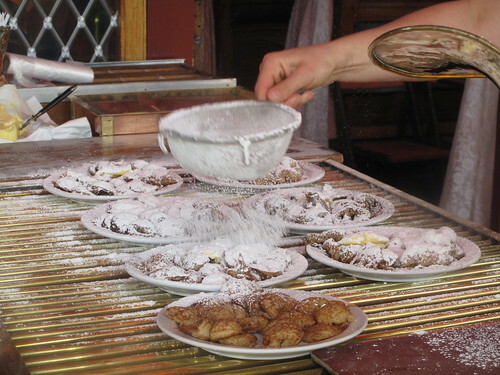 First each plate receives the butter and then with great liberality, the sugar is strewn over the poffertjes. And then they are ferried off to waiting men and women and children….close-by. 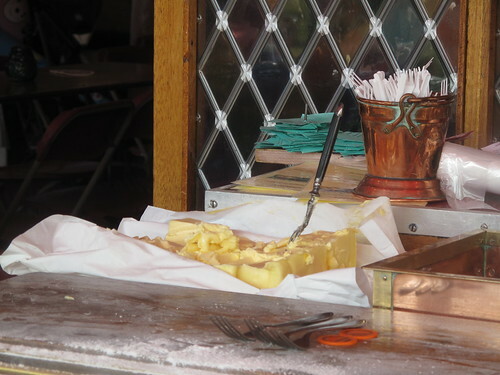 Minutes later, the plates are cleaned up…butter, sugar and all. 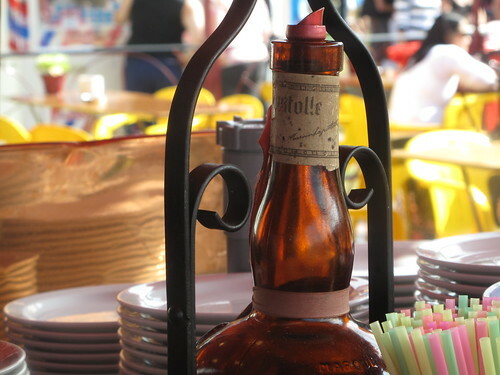 Should you desire some liquer, as an adult. That’s granted (They may as for ID too). And fruit, that too is on the menu, for kid and man alike. 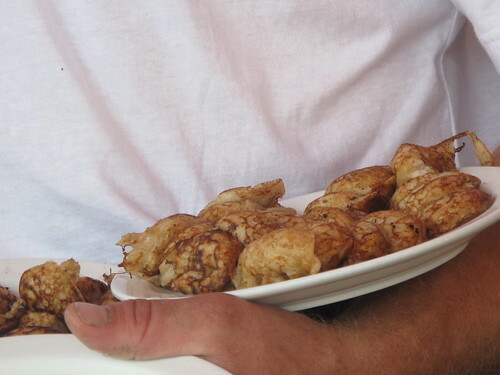 All in all, the baking of the puffs takes about 5 minutes from start to finish. An amazing and palatable feat, well done!